Make tomato sauce by crushing garlic and salt, frying in lots of olive oil, without colouring. Add creamed tomatoes, salt and sugar and bring all to the boil. You only need to bring it to the boil at this point, as it will undergo further cooking during the processing time. Loosely pack the hot jars with the beans. Put in half the sauce, then squeeze in a few more beans until the jar is tightly packed. Top up with hot sauce. Give it a good shake, or poke around with chopstick, or similar, to make sure there are no air pockets. Fill it right to the top and apply lid, screwing on tightly. 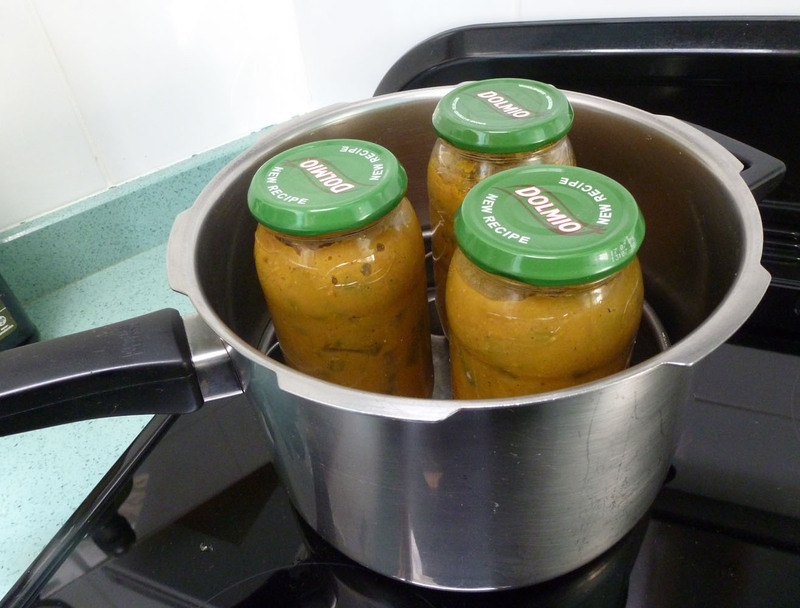 Make sure the water is boiling in the pressure cooker and position jars as in pic below – not touching each other. Put on the lid and bring up to pressure. Pressure cook for 40 minutes. The pressure should be gentle, but not allowed to drop at any time. After 40 minutes, turn off and carefully remove from heat. Allow the pressure to drop in its own time. I leave it for half an hour or so before removing the pressure cooker lid. Forcing things at this point can cause a pressure difference that makes the sauce squirt out! Undesirable. Pressure cooker with bottles (curry in this image), ready to start process. Note they shouldn't touch each other, and the use of a trivet, to keep them off the bottom of the pan. Hello! This sounds lovely. A friend has just given me a pile of beans from her garden so I might try this but eat it straight away! Eating it straight away is good! ‘cos they’re in a jar, the sauce gets forced through the beans and there’s no danger of it sticking and burning, which would probably happen on the top of the stove. It gives a different result somehow, more unctuous! All the vitamins and minerals should all still be in there, too, instead of leaching out.